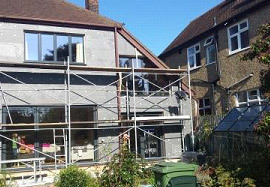 Be Constructive is one of the leading solid wall insulation providers in the southeast of England. With a long track record in offering insulation services to the commercial sector, the past few years has seen them take that expertise and deliver it to domestic homes and multi storey flats across the Greater London area. In 2013, Be Constructive teamed up with TheGreenAge, a leading environmental consultancy and energy saving advice portal for homes and small businesses. 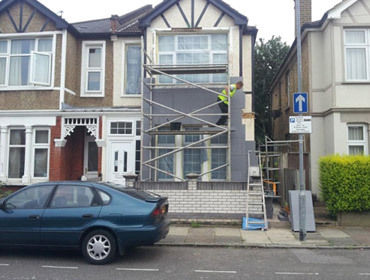 Together the partnership has rolled out a rapidly increasing number of external wall insulation solutions, which have helped both retrofit EWI projects as well as new build projects. How is external solid wall insulation installed? 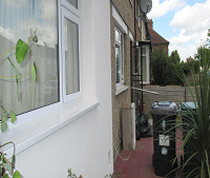 External wall insulation is installed by applying a layer of EPS to the outside of the exposed walls of your home. 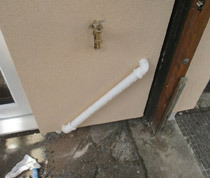 The material is initially stuck to the walls with concrete adhesive and then reinforced by mechanical fixings and plastic caps. 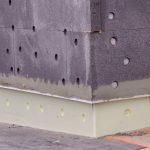 The system is further reinforced by a layer of adhesive and reinforcement mesh, and finished off with a render (either mineral / acrylic or silicone silicate), which is waterproof and can be coloured depending on the customer’s choice. 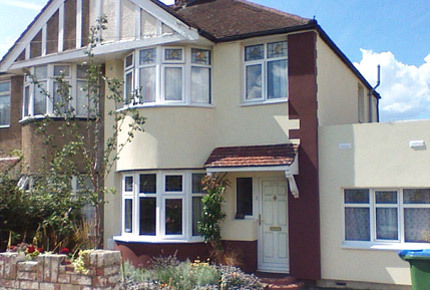 The EWI Pro system is an incredibly durable solution, lasting both the test of time and weather, whilst maintaining its superb insulating performance. 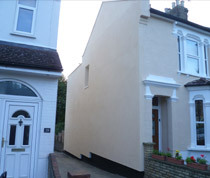 Insulating solid walls with external wall insulation (EWI) dramatically reduces heat loss from the property. In an uninsulated home as much as 35% of heat loss occurs through this area, so the presence of solid wall insulation can produce huge energy savings. For many properties built prior to the 1930s, solid wall insulation is the only insulation option since there are no cavity walls that can be injected. Wall insulation has a greater energy efficiency impact on the property than brand new A-rated double-glazing or a new condensing gas boiler. Be Constructive uses the integrated EWI Pro external solid wall insulation system, which dramatically improves the thermal performance of the walls. Not only do they then feel warm to touch but it also helps reduce condensation and the potential for mould build-up due to insufficient heating in the property. Our solid wall insulation system comes with a 25 year warranty. 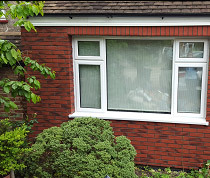 Not only will the EWI keep your home warmer in the winter months, but also help protect the underlying brick preventing any water ingress. Our system will help make your home nice and cosy in the winter and cool and dry in the summer – improving the quality of life for you and your family. 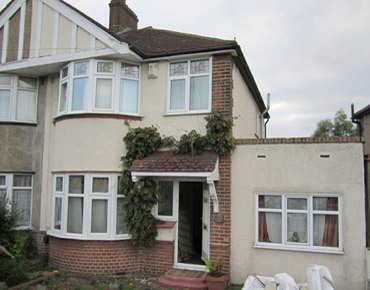 Be Constructive insulated this medium sized semi-detached family home just prior to Christmas 2013. The property had 3 exposed solid brick walls – front, side (above garage) and back. As this installation was completed in the middle of a cold December, the family were quick to benefit from a warmer environment in their home. 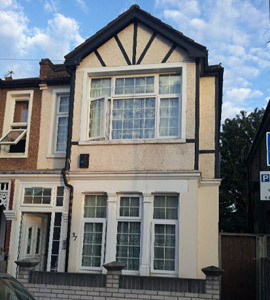 The team insulated this lovely detached property in central St. Albans, Hertfordshire – not only does the solid wall insulation provides a more energy efficient home, but it was paramount to make the installed air source heat pump cost effective to operate. 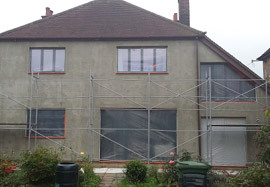 The property already had some insulation at the front of the property, which meant our solid wall insulation system was only applied to the side and back walls, insulating over 60% of exposed wall area. The Be Constructive team are hard-working, well organised, polite, and friendly and ultimately did a good job with a good final finish. 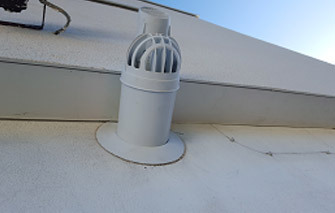 They accommodated small changes and responded to our suggestions as part of the installation process. 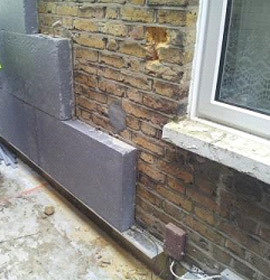 We had solid wall insulation installed to the back of a mid-terrace Victorian house in London. We were very pleased with the job carried by Be Constructive. Kuba was particularly very helpful in explaining the process and attentive in visiting the site regularly throughout the week. His team was quiet and efficient therefore minimising disruption to us and our neighbours. The job took a couple of days longer than expected, but this was due to bad weather and the team worked on Saturday to make up the time. The site was left clean and tidy on completion. I was really impressed with Be Constructive's professionalism and attention to detail. My property was previously leaking energy, but with the external solid wall insulation installed, I now have a nice and warm, cosy home. The site and office teams were very helpful in choosing colours and talking through various options of the installation process. I was massively impressed with their wire cutters that cut the insulation boards and literally left no mess behind! 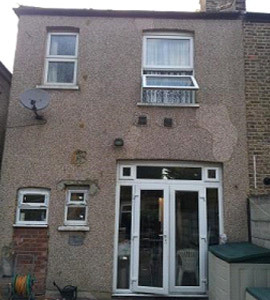 I looked to take advantage of the Green Deal scheme to get the front and back of my home insulated with external wall insulation. 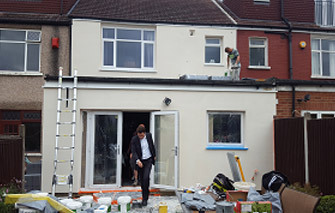 I was delighted to stumble across Be Constructive while searching for a London based installer on the web who was part of the Green Deal scheme. Jack and the team were incredibly helpful and did a great job on my home so I would absolutely recommend to other homeowners thinking of getting the same thing done in their homes. 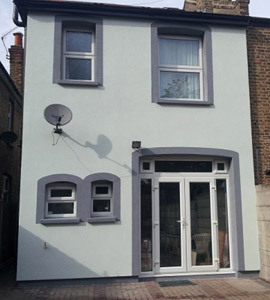 A homeowner replicating the previous look of his home with external solid wall insulation. 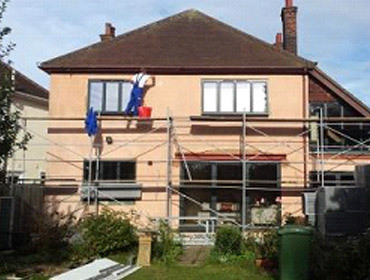 If your property has more than 1 storey we will require scaffold. We use an external scaffold contractor to ensure all scaffold is erected correctly and to the relevant health and safety standards. Scaffold is usually erected a few days before the start of the works. 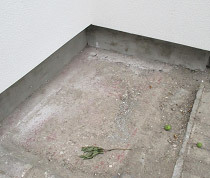 Stripping of Existing Render – Usually only necessary when rendering only or when existing render is in very poor condition. 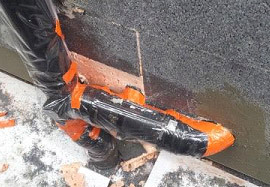 50mm EPS – For cavity walls or wherebuilding regulations are not needing to be met on solid brick walls. 70mm EPS - For cavity walls or wherebuilding regulations are not needing to be met on solid brick walls. 90mm EPS – Minimum to meet building regulations on solid brick 9 inch walls. 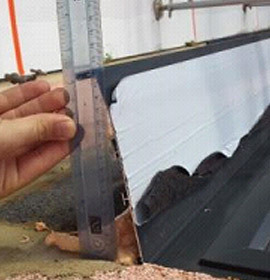 100mm EPS – Our standard thickness and recommended for most properties. 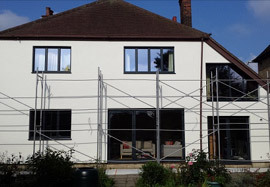 Silicon Silicate Render 1.5mm – Our standard render recommended for most properties. 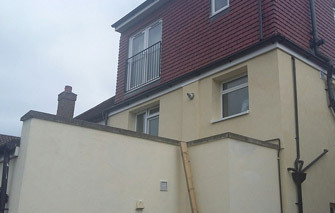 The colour of the render is mixed into the top coat, so no painting is required. Silicon Silicate Render 1mm - Our standard render recommended for most properties. 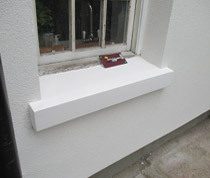 The colour of the render is mixed into the top coat, so no painting is required. 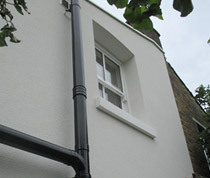 Silicon Silicate Render 2mm - Our standard render recommended for most properties. 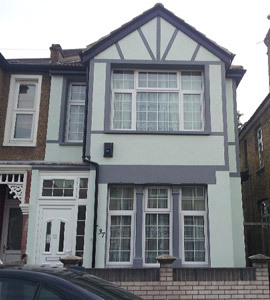 The colour of the render is mixed into the top coat, so no painting is required. 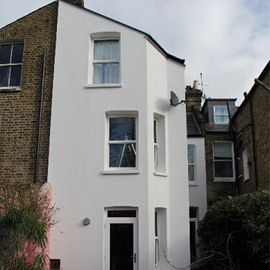 Mineral Render and Paint – Ideal for winter installation, this render requires painting of the top coat. Price on Request - Order may take up to 4 weeks. Please see our sills page for more details. 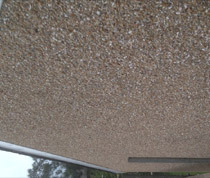 No Insulation to Tiled Area – We will bring the insulation up to the tiled area and leave the tiles undisturbed. Remove Tiles, Insulate and render to match rest of wall – We will insulate the tiled area and render just like the rest of the house. Insulate and Retile area – The tiled area will be retiled to give a similar finish to the existing tiled area. We use a standard starter track on our installations, but in some cases you may wish to add insualtionj or render underneath the track.